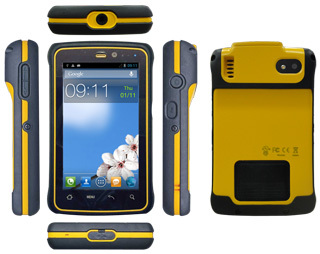 Winmate introduces the next generation of its Android-based E430M Rugged Handheld device. The new E430M2 retains the popular form factor of its predecessor, but is faster, easier to use, and includes numerous technology improvements. The new E430M2 is faster and more powerful than the predecessor model. A 1GHz dual-core Cortex A9 processor replaces the 650MHz ARM 11 found in the original version. RAM memory has doubled to 1GB SDRAM and storage has doubled as well; users now get 4GB eMMC. Onboard WiFi has been upgraded to 802.11 a/b/g/n for maximum wireless voice/data speed and flexibility. Most importantly, the new E430M2 is based on Android 4.1 ("Jelly Bean"), which offers full dual-core support as well as numerous technical and user interface improvements over Android 2.3.4 ("Ginger Bread") used in the older version. On the ruggedness side, all Winmate Handheld Series devices are designed to be used in harsh environments. The E430M2 offers IP67 sealing (standard model, w/o sensors), a 5-foot drop specification, and a -20 to 60 degree Celsius operating temperature range to allow the device to be used in any harsh environment. The upgraded Android 4.1-based Winmate E430M2 rugged handheld PDA with its sharp and bright 4.3-inch 800 x 480 pixel projected capacitive touch display is the answer for customers who require a modern, flexible, high-performance mobile computing device that will not easily break on the job.